I've got these scattered about in blog posts and in his baby book, but I always find myself searching back for "when did he do that again??" So I'm trying to put them all in one easy to access place. I'll try to update it as we reach more milestones, but I can't promise I'll always remember. First time out of State: 7/29/2017 - Trip to Maine at 2 months old (although we pass through NH first). First Red Sox Game: 8/18/2017 at 2.5 months Sox vs Yankees! Waving (Hello only, not good-bye): 2/18/2018 at 8.5 months. Good-bye came closer to a year. First Steps: 6/04/2018 at one year he would take a couple of steps towards a toy. Walking regularly: 6/15/2018 at one year, he's running all over the place now! First night away from Mama: 8/25/2018 at 15 months. Second Tooth: 8/29/2018 at 15 months, top center. First Babysitter: 12/22 - 12/25/2018 at 19 months. E spent 4 days with grandma and grandpa while G was on his way, and everyone did great!! E's first sponge bath at home was on 6/03/2017 at one week old. It was given by Grandma because Caitlin and Tom were too nervous. 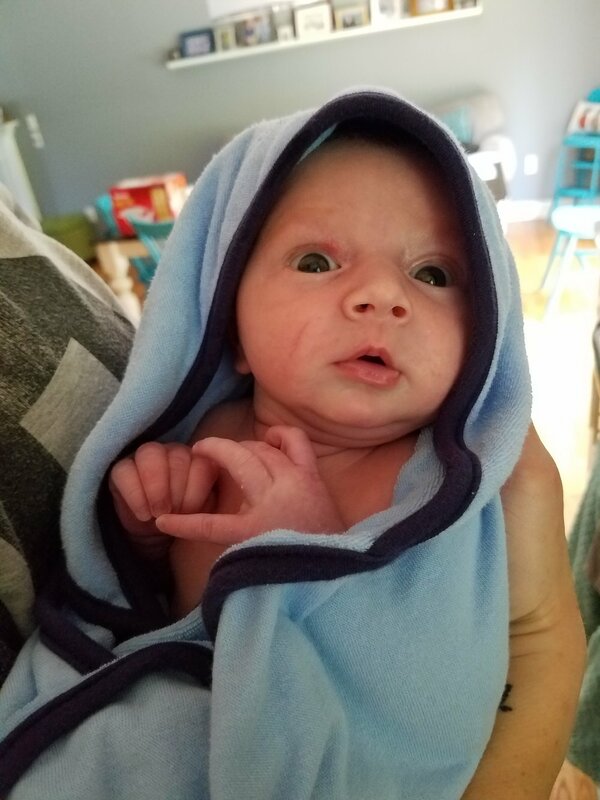 E's first real bath was given by Aunt Raina on 6/11/2017 when E was 2 weeks old. Again because Caitlin and Tom were too nervous. E's first bath alone in the big tub was on 3/25/2018 (10 months). It sort of happened earlier on 3/03/2018 (9 months) when he took a bath in a big tub, but with Caitlin in there as well after a trip to the beach. E's first night alone in his room, in his crib was 9/28/2017 at 4 months old. The first night he went through the night without eating was 11/17/2017 at 5 and a half months old. He still woke up a few times, but with a pacifier he went back to bed. The first time he slept through the whole night was 11/29/2017 at 6 Months old. However we then had a big setback where he was back to waking up almost hourly until we did a full sleep reset. By 12/25/2017, at 7 months old he was back to consistently sleeping through the night. I think we're calling "Mama" his first word and we'll use 2/18/2018 as a date (8.5 months old). After Tom gave E a bath, he was trying to wipe his nose (which he HATES) and he started yelling "MAM-MA-MA-MAM" and when I ran in the room he lifted his arms up to me like he wanted me to pick him up. He's done it a few times since, but I think he's using the word more for "I'm upset, pick me up please" instead of specifically calling me, but he definitely gets what he wants every time he says it! Tom says he started saying "dadada" on 3/30/2018 (10 months) but he doesn't really use it purposefully and he's pretty much stopped saying both dada and mama at this point. E finally said his first non-mama/dad word! At 14 months (8/01/2018) he mastered the word "Hi" and has. not. stopped. since. It's adorable. He's also getting better at "uh oh" and occasionally says it instead of "Ut." Next up might be banana. He says "ma-na-na" which either means "Mama, I want a banana" or "More banana!" E's first First Puree Food was on 10/07/2017 when he was 4 months old. He had pumpkin, and he didn't really like it that much. He didn't really like purees in general. His first Solid Food was a green bean at Thanksgiving on 11/23/2017 when he was 6 months old. He loved chewing on it while the rest of us ate our dinner. His first day of eating 3 full meals was on 1/14/2018 at 7 and a half months old. He still got most of his nutrition from bottles until he was 1, though.